It's that time again! Another fun challenge with the Tic Tac Toe X team and since this week's board is one I created I decided to go all out and use all 9 elements this time! This is definitely a mixture of lots of different products from different companies. 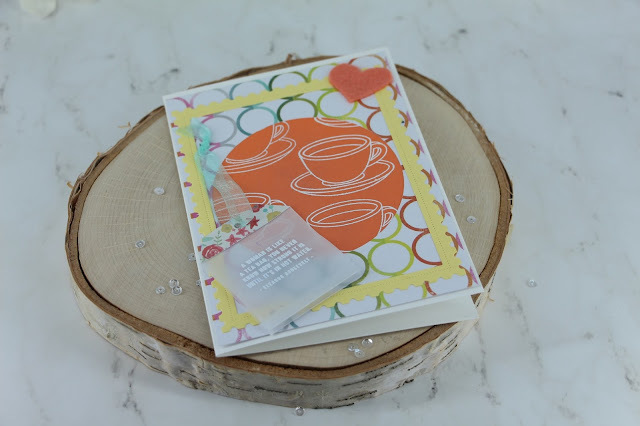 I used this Simon Says Stamp set to create an encouragement card with a lady in mind. I have found there are and have been many inspirational women in my life. 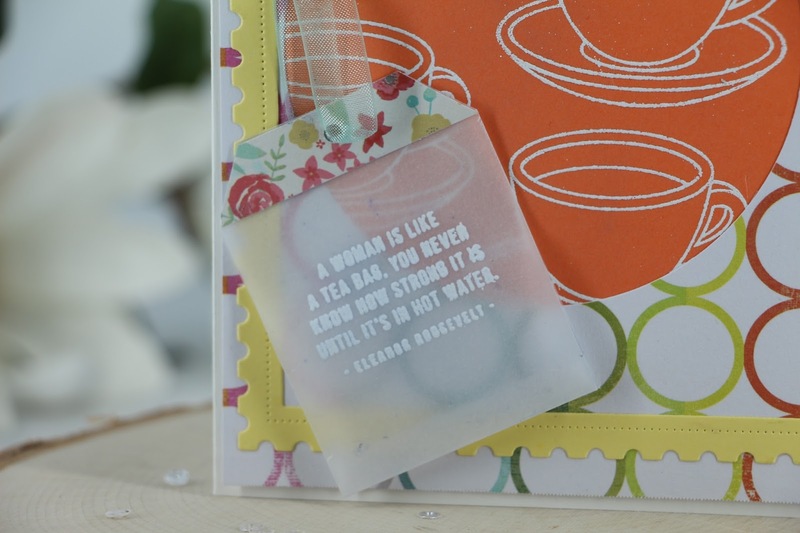 I think it's definitely true that women are strong and the sentiment I used is a saying from Eleanor Roosevelt that I just "had" to put on a tea bag made of vellum for today's card. In my photo (very back) is one of the floral tea cups my late great grandmother had - I claimed this set after she passed. She was definitely the epitome of a strong woman!! I also love supporting the products from companies that have been started by other women and their small businesses. 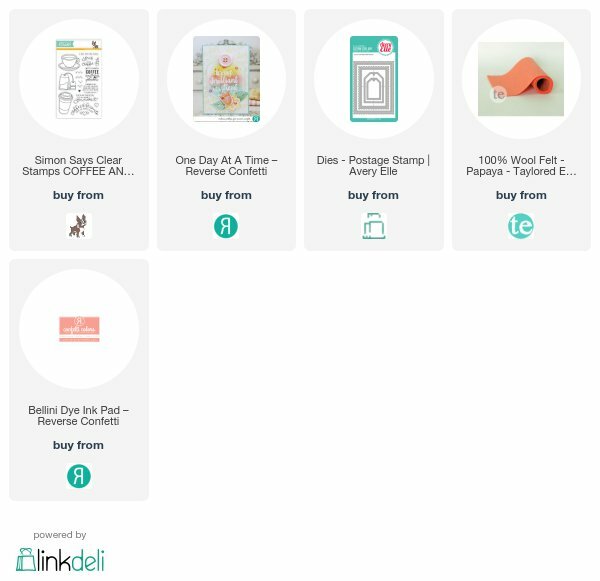 I do appreciate the wonderful variety of crafty things that are available to all us crafters - there is no lack of stamps and other supplies that help us bring our paper craft creations to life. I started this card with a base of circle patterned paper from my stash and die cut a big circle out of the middle of it. 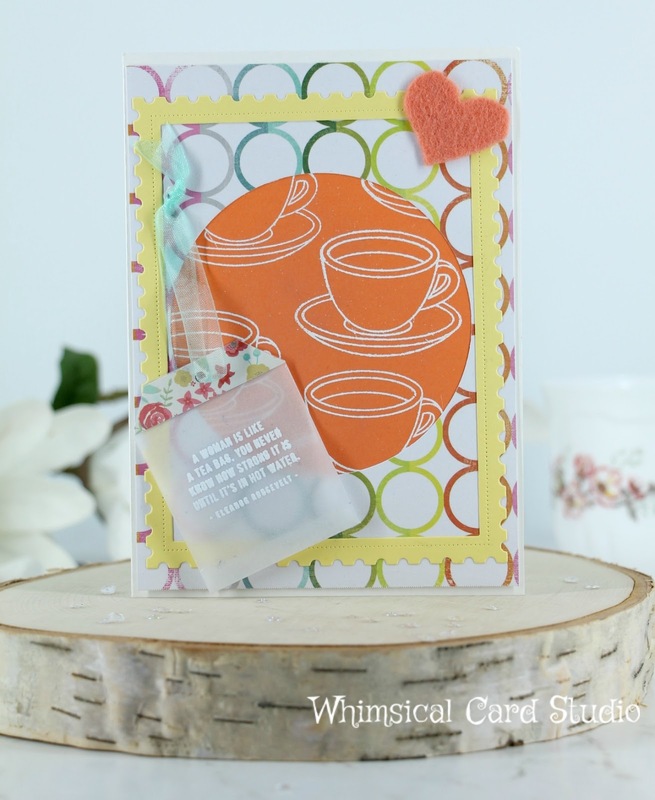 I stamped the tea cup and saucer multiple times in Versamark onto a coral colored solid piece of cardstock, then added white detailed embossing powder and heat set to go behind the opening. Next I die cut the yellow frame from the largest die in this Avery Elle die and glued that on top of the pattern paper. 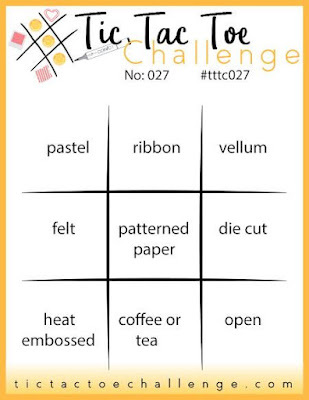 The tea bag was not created from a die cut - since the shape is simple I used a piece of vellum and cut it to a rectangle about 2" x 4.5". I folded it in half, then I scored it on either side of the middle fold, then folded it so there was sort of an accordion fold on the bottom that looks like a W when you see it from the side. I took my detail scissors and hand cut a little notch on either side at the top. I added a little piece of patterned paper at the top of the tea bag, punched a hole, then added a pastel green ribbon through the hole and added a knot I glued down the tea bag by adding adhesive under the paper piece (not the vellum) and on the knot. I weighed down for awhile with a stamping block until the glue had dried enough to stay in place. I added my layered panel to an A2 sized white card base. Inside the card I stamped this Reverse Confetti sentiment saying "you've got this" to complete the card with their Bellini ink. In order to fulfill the felt requirement I added a coral felt heart at the top right side. The felt is from Taylored Expressions. 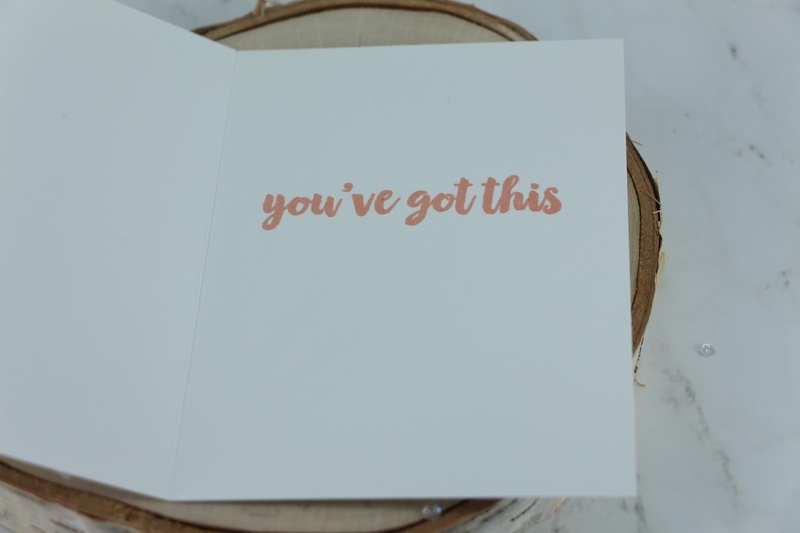 I hope that this will inspire you to send a special note or card to a special person you know who needs some encouragement right now. WOW - all 9 boxes - fabulous effort and gorgeous card.